With an electric mixer on med-high, beat butter, oil, sugars, egg & vanilla for 2 minutes until thick. With mixer on lowest speed, stir in flour mixture followed by chocolate chips and nuts. Drop dough by rounded tablespoons onto parchment. Bake 10-11 minutes, no more. They should still be soft. Cool on baking sheet for 1 minute. Remove to a wire rack to cool. Note: For whole wheat cookies use 3/4 cups all purpose flour + 1/2 cup whole wheat pastry flour. 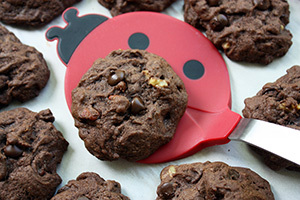 10 Comments on "Double Chocolate Chip Cookies"
I appreciate you for sharing such a nice recipe! I made your double chocolate chip cookies last night, and they were very delicious! I was not sure it was right to use rounded teaspoons for dropping dough not tablespoons, but I just did it because I wanted to follow your direction. They were super cute, and I loved it. Anyway I am just curious you meant teaspoons not tablespoons for shaping. I am going to get some sprouted wheat and make your sprouted whole wheat flour bread! Thank you, Jenny! Merry Christmas and happy new year! Yes, that is confusing. I generally use 2 teaspoons to drop the dough but I will clarify that is should be a tablespoon for size. Thank you for asking. What brand of chocolate chips cookies do you use? Are they semi sweet. I didn’t use semi sweet and also they don’t see to melt like shown in your picture here. I often use Guittard brand semi-sweeet. I only have white pastry flour. Would it be OK if I use that instead of whole wheat pastry flour? White pastry flour is very fine so I would suggest just using all purpose flour. I just made these and they came out soooo goood!!!!! No kidding I think I might make these again if I get the chance! I made these cookies today and I think that they are amazing. I will be making them again. 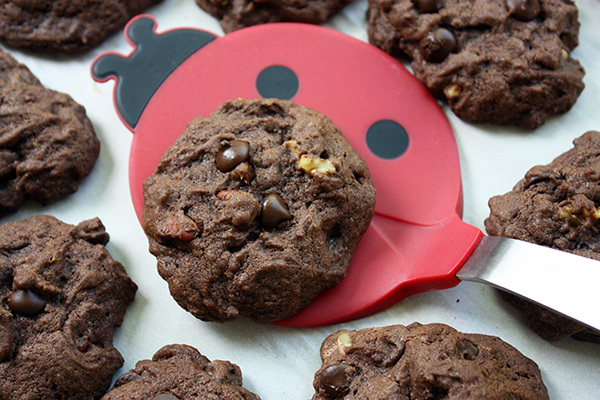 DO YOU HAVE A REGULAR CHOCOLATE CHIP COOKIE RECIPE? Yes, I do and will be posting it soon.